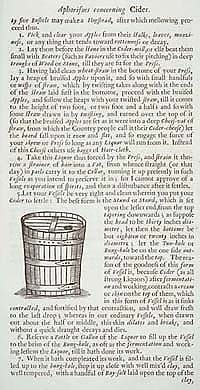 A page from John Evelyn’s Sylva, or a Discourse of Forest-TreesThe text gives instructions for the production of cider and the diagram is of Captain Taylor’s design for a settling vessel. Sylva was a collaborative work by fellows of the early Royal Society. Information on orchards made up an appendix, entitled Pomona, largely contributed by John Beale. Beale particularly extolled the virtues of redstreak cider, a liquor resembling white wine, and argued for the medicinal benefits of its consumption. Catalogue no.17, p.49. Evelyn’s Sylva was a collaborative work, written at the request of the Commissioners of the Navy, and undertaken by a number of Fellows of the fledgling Royal Society (founded in 1660), following a paper that Evelyn had given to the Society on 15th October, 1662. Perhaps the most successful of the various projects which Evelyn directed on behalf of the Royal Society, Sylva was later expanded in its second and third editions, and represented a major part of the Society’s claim to have achieved progress in practical matters. It was not a wholly original work, building as it did on the writings of Interregnum improvers like Blith and Austen (see catalogue nos.15 and 14 ), who had also been concerned with the danger of a timber famine and with the best means for its remedy. Among those who contributed to Evelyn’s volume was John Beale (1608–83), rector of Yeovil, Somerset, who had been one of Samuel Hartlib’s most frequent correspondents during the 1650s. In 1657, Hartlib had published Beale’s Herefordshire Orchards, which described the cultivation of apple and pear orchards, and extolled the virtues of cider and perry. Beale argued that the planting of orchards would promote trade and industry, without which the word of God was ‘at the best … a pleasant song’, and suggested that, in the groves of the orchard, ‘we approach the resemblance of Paradise, which God with his own perfect hand had appropriated for the delight of his innocent Master piece’ (Herefordshire Orchards, pp.39 & 48). From 1662, Beale had been encouraging the Royal Society to undertake a campaign to promote the growing of cider apples throughout England. The appendix to Evelyn’s discourse of forest trees in Sylva, entitled Pomona, was largely contributed by Beale, although it was polished and ordered by Evelyn prior to publication. Pomona gave advice on the cultivation and management of orchards, and the production of cider. In it, Beale particularly extolled the virtues of redstreak cider, a liquor resembling white wine, and argued for the medicinal benefits of cider consumption. He also defended his choice of fruit for cider making against criticisms raised by Austen. Other Herefordshire cidermen whose writings contributed to Pomona included Captain Taylor, whose settling vessel for the drink is illustrated overleaf. Sylva and Pomona continued the debates about the best way to manage forests and orchards for the good of the state and the profit and health of individuals, which had begun in the 1650s. Beale’s contributions reflected his belief that real improvement could only come about through a return to ancient practices, of which the oldest was the cultivation of fruit trees in orchards and groves. Evelyn’s ‘Historical account of the sacredness and use of standing groves’, added to later editions of Sylva, in 1670 and 1679, to some extent shared Beale’s preoccupation with the recreation of Eden in this way, as did Abraham Cowley’s poem, ‘The Garden’, which was printed in the third edition. Geoffrey Keynes, John Evelyn: A Study in Bibliophily with a Bibliography of his Writings (2nd edition, Oxford, 1968), pp.129–36&147–51; I[ohn] B[eale], Herefordshire Orchards: A Pattern for all England (London, 1657); Lindsay Sharp, ‘Timber, Science and Economic Reform in the Seventeenth Century’, Forestry, vol.48(1975),pp.51–86; Mayling Stubbs, ‘John Beale, Philosophical Gardener of Herefordshire Part II: The Improvement of Agriculture and Trade in the Royal Society (1663–1683)’, Annals of Science, vol.46(1989),pp.323–363.